KraussMaffei’s newly launched GX series will make its premiere at Fakuma 2012, with the focal point on thermoplastic lightweight application in CellForm technology, which combines with Trexel’s MuCell process for the automotive industry. 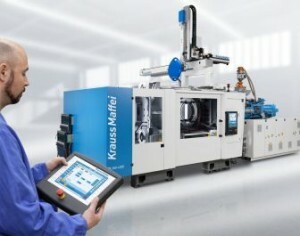 After the market launch of the GX series in May, KraussMaffei is satisfied with the response by customers. “Both the worldwide demand and the sales figures to date exceed our expectations,” said Frank Peters, Vice President Sales at KraussMaffei. At Fakuma 2012, a KraussMaffei GX 450-3000 will demonstrate the production of a so-called telephone cradle for an automotive interior using CellForm technology with physical foams. The entire production cell will showcase high productivity and innovative detailed solutions for zero defect production and production intelligence, the company notes. “When combined with a MuCell equipment package and the precise injection and plasticizing unit, the GX series is almost predestined for process-reliable production of foamed parts,” said Dr Bourdon, Vice President Technologies at KraussMaffei. “This automotive application shows the enormous potential still contained in lightweight thermoplastic solutions.” The high shot weight constancy of less than +/-0.1% ensures reliable production. As one of the fastest dual platen machines in the market, KraussMaffei says the GX offers the shortest travel times and maximum productivity. The smooth-running mechanics reduce traction resistance by up to 80% and ensure, together with the hydraulic concept designed for minimum flow losses, maximum energy efficiency. Completely automatic production takes place in a fully integrated production cell with a LRX 250 linear robot that is fitted with the handheld pendant of the new MC6 control system, which according to Mr Peters, “the detailed coordination of both components, the GX and the robot, creates a production cell which appears to be ‘cast from one piece’. Visual aids also assist the machine operators. Workspace monitoring by means of a camera inside the safety guard provides the operator with an up-to-date video picture on a separate screen next to the MC6 control system. It simplifies and reduces the start-up and service procedures, and leads to higher operating safety with fewer interruptions in production.